Finland's Journalists Seem Very Excited to Meet Donald Trump! 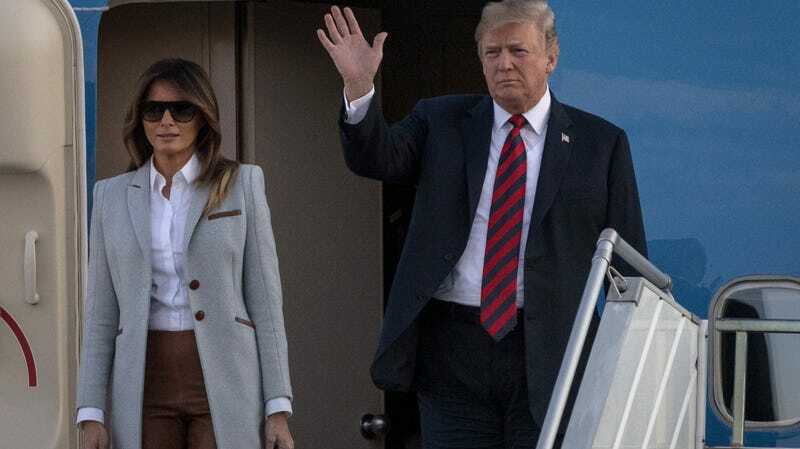 With England’s monarchy successfully in shambles, Donald Trump has arrived in Helsinki, Finland, the site of his “historic” summit with Russian President Vladimir Putin. The duo will sit down Monday to discuss, I assume, dismantling the current Western powers, the joys of oligarchy-ing, and also how Putin got his pecs, which Trump will probably want to touch. And just as Londoners feted Trump’s U.K. visit with massive protests, Helsinki residents seem super psyched to meet Mr. MAGA—particularly the editorial staff of Finland’s biggest newspaper, which has posted citywide ads excoriating Trump’s and Putin’s combative relationship with the press. It’s not a baby Trump blimp, but it has its own bite, I suppose. Finland has been long ranked one of the top nations in the world for press freedom, and in 2018 it came in as #5 on the World Press Freedom Index. The United States landed at a coincidental number 45 on that ranking, down from 43 the year prior. Russia is at a depressing 148, out of 180 countries total. Finland also has saunas, publicly-funded healthcare, reindeer, the Northern Lights, and free baby boxes. Let’s all move to Finland! Grotesque &apos;Trump Baby&apos; Blimp Takes to the Skies!